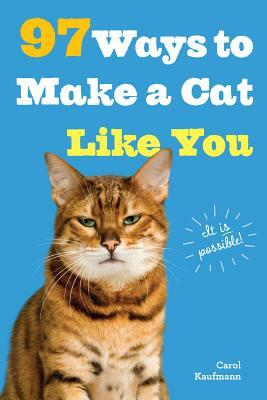 From the publisher of B. Kliban’s Cat, All I Need to Know I Learned from My Cat, and Bad Cat, comes a new book that answers the question all cat lovers ask: How do I make my cat like me? There’s the “Eye on the Ball”—record a tennis match or a Ping-Pong game on TV to play back for your cat when he needs a bit of exercise. “Cat Burrito”—wrap your cat in a towel, burrito-style, which is particularly good for anxious pets or trips to the vet. The “Boing, Boing!”—wind pipe cleaners around a pencil in a spiral shape to create springs. Carefully slide off the pencil so the spirals go “boing” when pressed. The classic “Tickle, Tickle”—tickle Kitty under her chin and softly say “gitchy, gitchy, gitchy” in your highest-pitched voice. And for the cat owner willing to go the distance, the “There’s No Business Like Show Business”—practice your best Ethel Merman by belting out favorite show tunes for your cat. Kitty won’t care if you’re off-key and she’ll enjoy the stimulation. Carol Kaufmann is the author of 97 Ways to Make a Cat Like You and co-author of the bestselling Photicular books Safari, Ocean, and Polar (Oct. 2015). A freelance writer and editor, her work for National Geographic and other publications has taken her to all corners of the globe, from the Pacific Ocean’s floor to the top the Atlas Mountains. In addition to National Geographic, her writing has appeared in the New York Times’ Draft column, Reader’s Digest, where she was the National Affairs Reporter, The Washington Post, George, and in the anthology A Woman’s Europe. She is also the author of the ebook, MamaTricks. She lives in Alexandria, Virginia.